The other night, I was getting annoyed by the rattling of my house caused by my subwoofer. And it got me thinking. Since my sub is on a floor that is above the basement, I thought a lot of the noise could be cured by getting a Subdude or something similar. Then it occurred to me that I had a few pieces of Gold's Gym High Impact Floor Matting ( http://www.walmart.com/catalog/product.do?product_id=11089966 ) just laying around taking up space. I figured I could put it to use under the sub. I did so. Right now, I have one piece (2' x 2' x .5") under the sub. It has cleaned up a lot of the rattle. If I get industrious, I may try increasing the thickness by adding the remaining pieces. I would like it if someone would provide a technical explanation of why most of the rattle has gone away. I would also like any opinions about whether a Subdude or some specialty product would do anything more for me than these gym mats. They are made of EVA foam ( http://en.wikipedia.org/wiki/Ethylene-vinyl_acetate ). It reduces direct coupling of sub's resonance to floor. I use those floor mat for my sub. I cut them to 5"x5" and layered them with contact cement to make it thicker, then put them under each of sub's feet. I also use them under my front 3 speakers. I went with those because they feel about the same (to my fingers) as Auralex Mopad and much cheaper. You're both dealing with hard surface flooring I presume. When the woofer cone moves out, the air gets compressed in front of the cone and also provides resistance to the cone which in turn makes the subwoofer enclosure want to move in the opposite direction of the cone movement. That pressure which is trying to move the enclosure as the cone is moving is focused on the feet of the enclosure which couple the enclosure to the floor. Thus the floor is being pushed one direction when the cone moves out and the opposite direction when the cone moves backward. Those stresses are similar to you rocking back and forth from your right foot to your left over that spot on the floor with 100% of your weight. It can cause creaking and rattling in the house. When you decouple the enclosure from the floor, the enclosure can actually move rather than applying stress where the feet meet the floor. Thus the creaking and rattling noises are reduced. You can also get serious rattling from the acoustic output from the woofer which no amount of decoupling can cure. My HT is carpeted but my speakers and sub are heavy enough to cause direct transfer to subfloor if not isolated. I have something similar that the previous owner of my house left behind. I might clean those up and give it a go. I use those pads designed for putting under the feet of furniture when you move them. The ones that are rubberized with the felt backing on them. Cheap and works great. 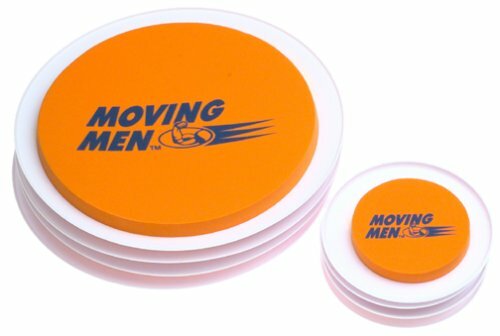 You mean those "moving men"? If not, I wonder if those would work. The side that touches the floor is hard, but the side the sub would touch has a lot more give to it. I don't think they are thick enough to be effective. Given time, the foam will sag under pressure if subs have pointed or small feet and it will touch the hard plate at the bottom thus going back to direct coupling to floor. If you look at Auralex Mopad, they are at least 1" thick. I've looked around for cheap alternative to Mopad and this gym floor foam is about the best one if layered with glue (contact cement). Nah not those. The ones you can get from Walmart. They're pretty thick and available in a few different shapes and sizes. I bought a large square of it and cut it into pieces and put them under my tower speakers too in place of the spikes. What happened to the Rock and Roll Gymnastics Competition? In the 90's there was a Rock and Roll Gymnastics Competition that athletes like Dominque Moceanu used to preform in. Do they have it anymore? Or is it replace by Progressive's Skating and Gymnastics Spectacular? Either start making sense, or you'll be banned as a spammer. At the old place, I didn't even bother. Gone.